Picture this: You and your honey-to-be are having the rustic-inspired wedding of your dreams, surrounded by your best friends and closest family members. Sure, there’s someone off in the distance that neither of you really recognise (second cousin from Tauranga brought her boyfriend without permission, perhaps? ), but it doesn’t even matter because you have each other and a swath of towering redwood trees to ensconce you in eternal happiness. So what’s missing? Nothing, really. The whole thing sounds just dreamy, but when we think about woodsy weddings from a decor standpoint, well, there’s ALWAYS something to add to the backdrop, be it a lemonade stand or hay stack. But what if there were pop-up tents for your guests to hang out in, filled with everything from real beds to wool blankets? Pretty awesome, right? We felt the same way, which is why we were beyond excited when we had an opportunity to chat with the team behind Just Hitched, a mobile event company that creates the sleep vignettes we just described. Check out some intel we snagged from Melinda Evans, co-founder of Just Hitched, below, then sound off in the comments and let us know if you’ve ever had tents at a wedding or party. What’s the Just Hitched story? Have you always been drawn to the nostalgia of camping?The idea of Just Hitched came about in casual conversation while on our honeymoon in February of this year. We had struggled to find vendors who were willing to accommodate for our rural location and there was a huge lack of customer service especially from some of the larger companies. The day before our wedding we were running around like headless chooks collecting hired items from Auckland/Waikato & everywhere in between. We experienced shocking customer service, items that were broken/not working/dirty and overall it was not an enjoyable experience. Being rural we also struggled to find ‘nice’ accommodation to spend our wedding night without having to drive 60 minutes or more with our nearest motel/hotel being 30 minutes away and above a pub (not the ideal romantic accommodation we had in mind) so we ended up staying the night at the parent’s house. During our honeymoon, conversation kept circulating around the need for wedding & event hire services that actually cared about their products and their customers. Between us we came up with what our ideal wedding accommodation would have been like. We wanted a ‘pop-up’ style accommodation option which meant we did not have to travel far (we got married on our family farm). 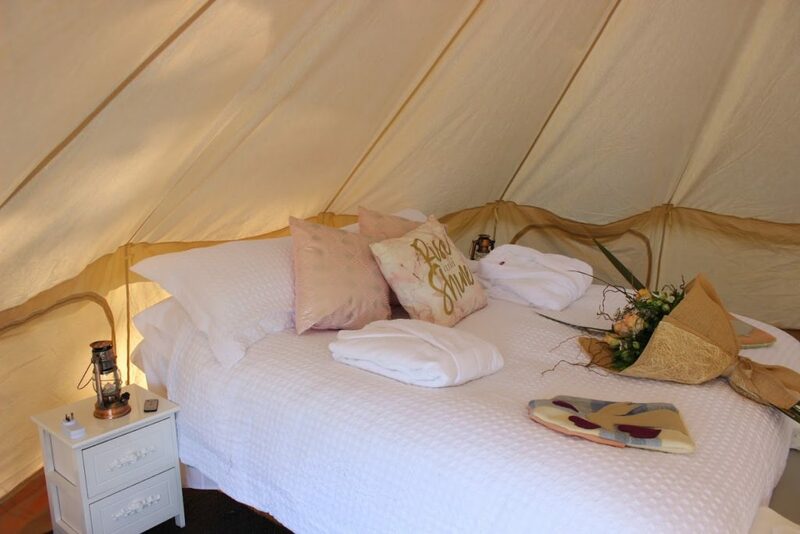 We loved the whole ‘glamping’ idea but with options so far away we thought ‘why can’t we take glamping to the people?’ This is where the idea of our luxury glamping experience originated. 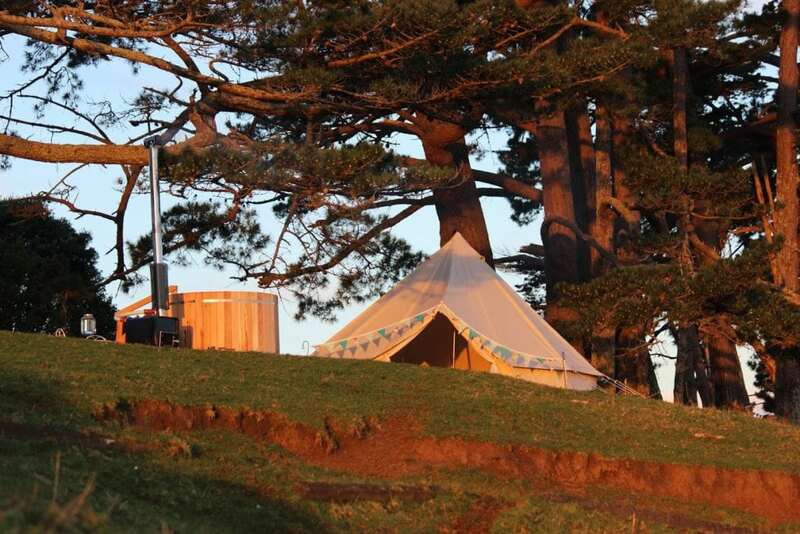 Think camping but with the luxury trimmings of a boutique hotel and best of all at a location of your choice. What type of wedding/couple are luxury tents best suited to? 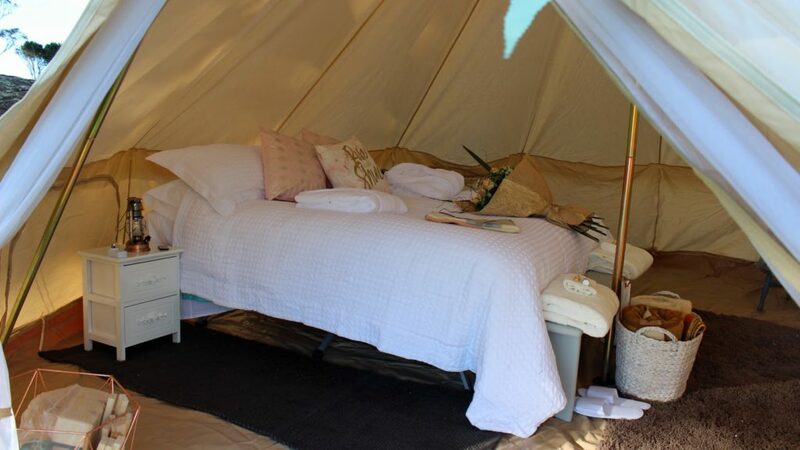 Our luxury glamping experience is exactly that ‘luxury’. We are the perfect option for couples wanting a romantic night or two away from the hustle and bustle of city living. 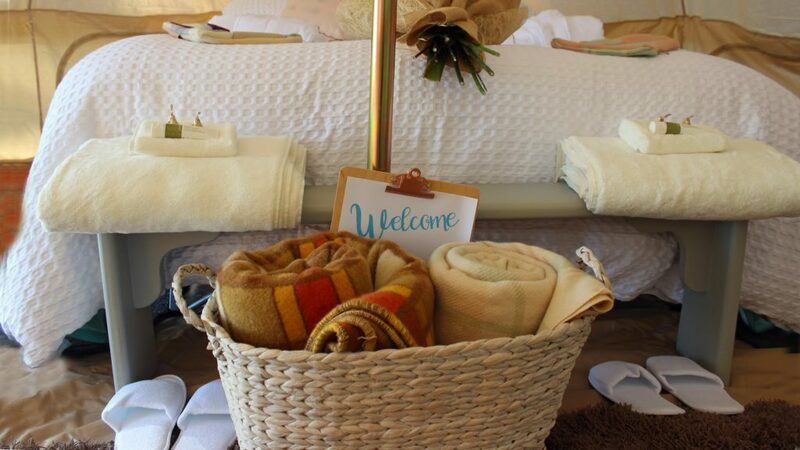 When we aren’t travelling to you, we also have the option of hosting guests on a gorgeous property in Pukekawa. We have had inquiries from couples wanting to celebrate a birthday/anniversary to those wanting that ‘special’ accommodation option for their wedding night. We have spoken to couples wanting a mini honeymoon as well as groups planning a hen’s party. In a nutshell we can tailor packages to suit most occasions. Describe your glamping suite to us. What’s included? And err… what about the loo? 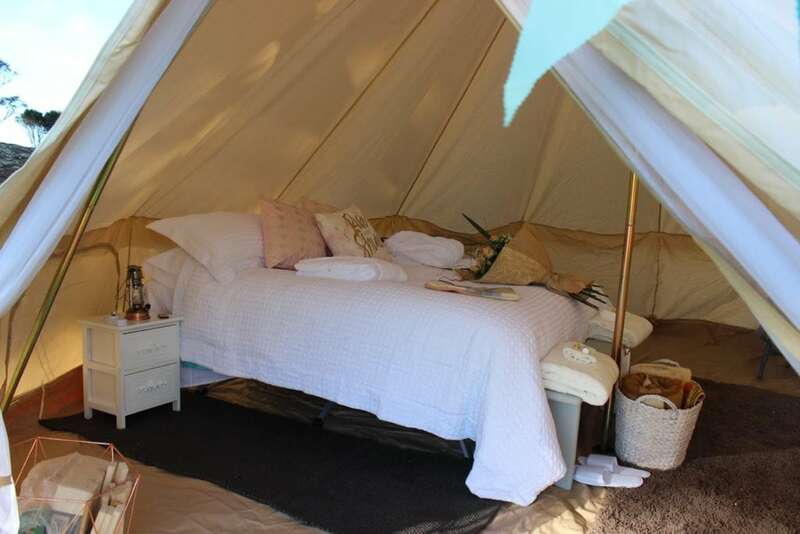 The core of our glamping experience is the tent. The tent is a 5m bell tent (a design of tent that originates from WW1). 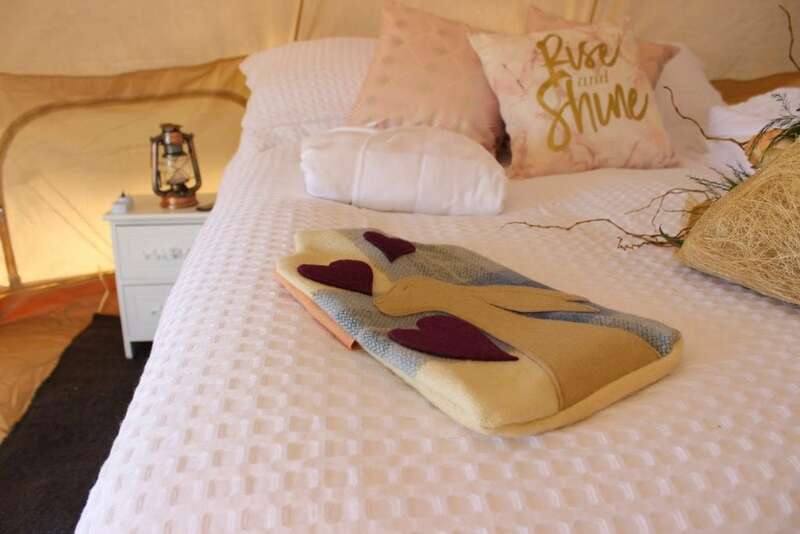 Inside the tent we have a comfortable queen size bed with quality linen, a romantic fireplace (for the cooler months), hotel quality linen, carpet throughout, spa robes and slippers, shabby chic inspired furniture, crockery/ cutlery and a gas cooker. 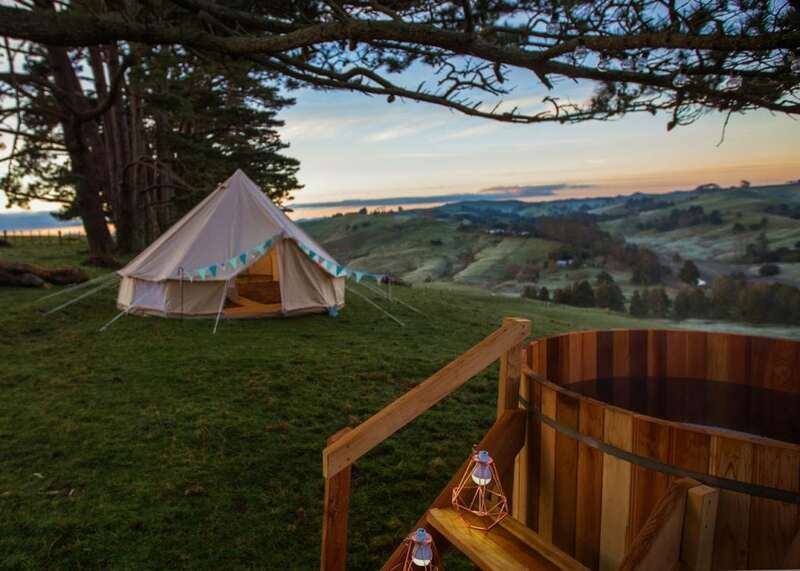 The glamping experience also includes private use of an outdoor wood fired/gas hot tub. 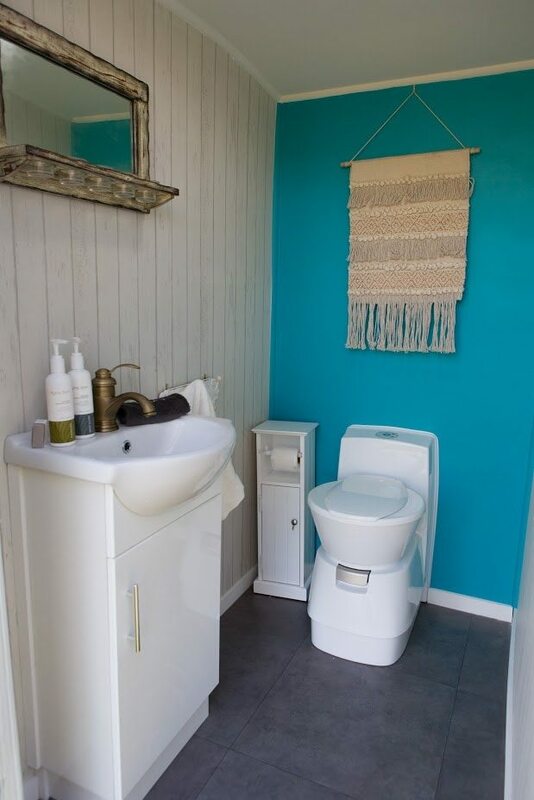 Guests also have the use of a modern bathroom trailer with a flushing toilet and wash basin. We offer a complimentary bottle of local wine and a selection of ‘Koha Spa’ toiletries during their stay. You do much more than assemble luxe tents, what other extras do offer that add to the camping-themed weddings? 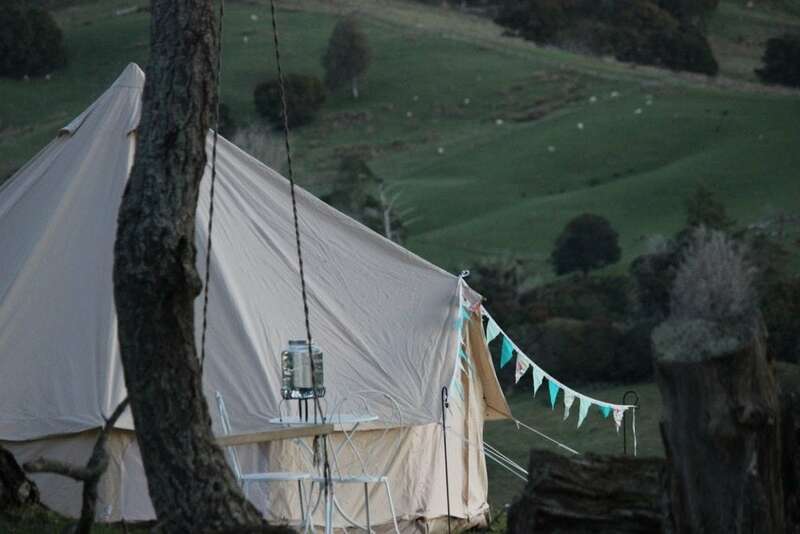 Glamping is only one of three main focuses for our business. 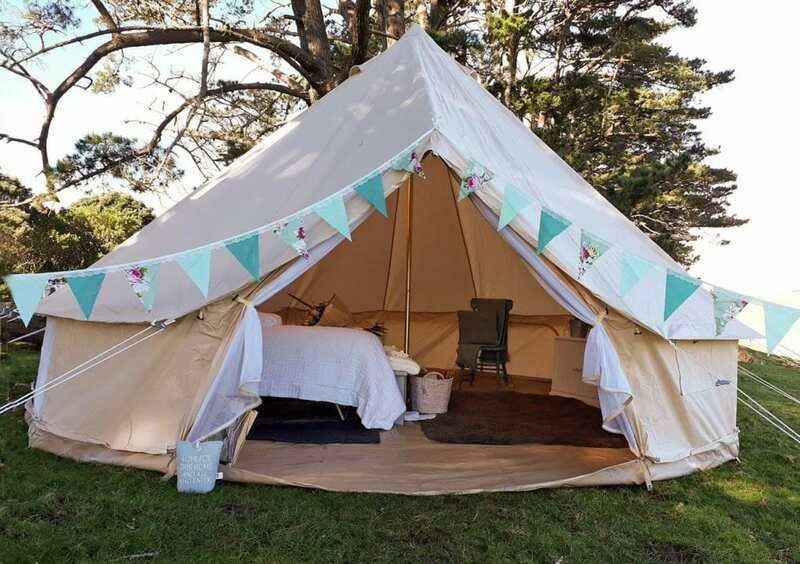 Alongside our glamping service we also offer wedding and event hire (we have marquees, tables, chairs and a range of NZ made, hand crafted décor items and props). What sets us ahead of the rest is also our delivery option. After having experienced the chaos of wedding planning we know the little things such as offering a delivery and pickup service takes away some of the wedding stress and adds to the customer experience. Our third focus is our gorgeous little ‘Poppi’, a vintage, travelling BYO caravan bar. Poppi is able to travel to weddings and events where two dedicated bar staff will serve your guests. She provides glassware, refrigeration, lighting, music and is also equipped to serve hot beverages. What are different ways a couple could include your pop-up luxury tents in their wedding planning? We are open to absolutely anything really. Proposals, hens parties, wedding night accommodation, mini honeymoons, birthdays and the list continues. 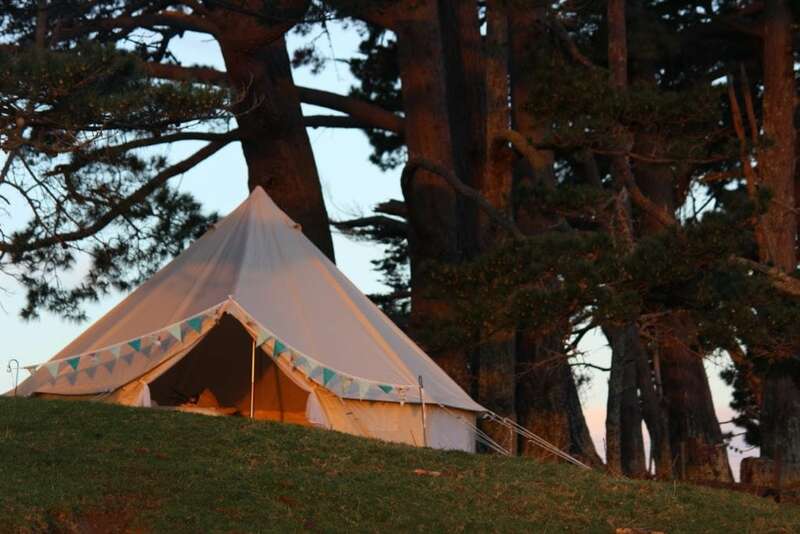 We also have a DIY tent option where we have 5m bell tents available to hire without furnishings. 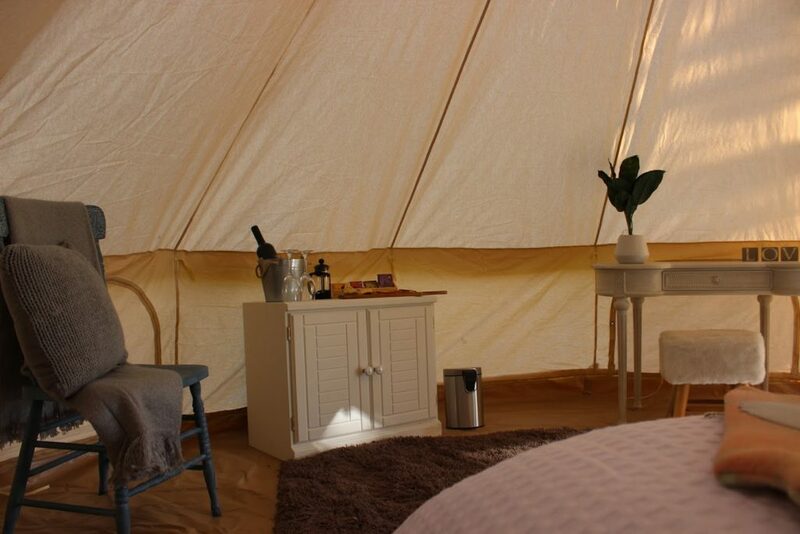 These are the perfect option for camping trips, extra guest accommodation or couples wanting to create their own glamping space. What do you like about what you do? What is most challenging and rewarding about what you do? We love it all. But the best part is seeing the smiles on our customers/guests faces knowing that we have played a small part in making their day that little bit more perfect. The most challenging aspect is thinking back on our own wedding day and wishing we had the same options that we are now providing to other couples. Wedding planning can be stressful, what are your top wedding planning tips and how can Just Hitched help? As recent newlyweds, ourselves we know the stressors involved in wedding planning. Our goal is to reduce the stress load on our customers whether that mean providing a delivery/setup and pickup service, being flexible on length of hire, ensuring all our costs include GST and travel where stated (because we all hate those little surprises added to our bill after careful saving and budget allocation. My biggest tip is to ensure all quotes include GST and if unsure make sure you ask. Finding hidden costs can be a major stressor and it all adds up. I also strongly suggest to start booking your major vendors ASAP; photographers, venues, marquee hire and accommodation always book out relatively quickly during wedding season. But most importantly, your wedding day goes by so fast. Take time during the day for just the two of you because it is those moments that you will treasure and remember the most. Although things will go wrong on the day, think and ask yourself if it will really matter in ten years’ time because most often than not it won’t. The most important thing of the day is to marry the one you love. Having just launched on September 1st, our immediate goal is to continue taking bookings. 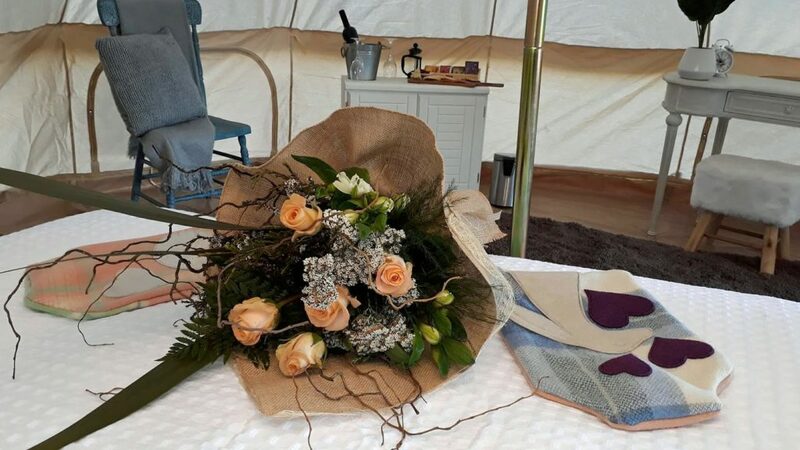 Thankfully and as we expected the glamping experience has been a huge hit with multiple guests already and many bookings throughout this wedding season. We also have a few wedding expos to attend where we are looking forward to showcasing our services to brides and grooms to be in the Auckland and Waikato regions.